These small 10 penny sized stickers can be used to track and find your items. They come with a 3M sticker on the back, so can be stuck on to various devices (say your remote), or slipped into your bag. They can also be attached to your pets, or your luggage when checked in. A simple app can then be used to find the sticker, and hence help you locate it. Before I go on about the product, it must be mentioned that this is more or less an iOS/Apple device oriented product. An app for Android exists, but it only works with Samsung devices, and probably only the Galaxy range. I tried it with Galaxy S4, so while yeah, it works, you may want to check compatibility before you spend the money on this. Update: In fact, I have just had the 4.3 update pushed to my phone, and now the app isn’t working. I am sure an update will be pushed through fairly quickly. The only way to use these is via the app. 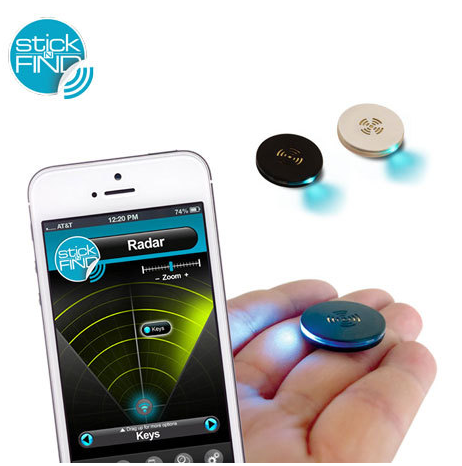 The StickNFind fobs or coins connect to your phone via Bluetooth, and that is how it can actually communicate with them. The Radar Mode, which allows you to locate your device on a ‘radar’. However, it doesn’t actually point what direction your device is in. It will, however, give you a rough estimate of how far the device is. This is mostly useful if you are looking for something, and want to know if you’re getting closer or further. It works, and it works pretty well, but the units do need a little getting used to. The Find It mode, is the next best thing after this, and probably the most useful. Whether you’re looking for your pet cat, or waiting at the airport for your baggage to arrive, you can use this mode. Walk towards your coin, and once in range, it will tell you that it has found it. Once found, you can either get it to ring a bell (accompanied with LEDs flashing), or switch to Radar mode and carry on fishing. A very clever way to use these, and I think it is probably the most useful. The Leash Mode, is another great mode which allows you to set a leash on any of these coins. Every time the connection is broken, your phone and/or the coin can ring, letting you know that the connection is broken. It can be things like keys, purse, wallet, or even your laptop. Obviously, you have to be careful when you put these on, because if not really required, they may end up sounding annoying. While once running, the app is quite useful, it does require you to create an id, which is annoying. However, this ID is then associated with your coins, so it is useful as far as security goes. The coins are transported in ‘sleep mode’, and they need to be woken up. While the instructions ask to tap them 3/4 times to wake them, it didn’t quite work. However, you have these (guitar) picks as part of the package, and tapping with them does the job quite well. Once awake, you pair your coin with your device, and you can give it a name. After that, go into the app to locate as and when you like it. You may have to log in again, and that can be annoying at times, specially if you are in an area with no internet, or in a different country where you don’t want to use roaming internet. These are based on Bluetooth 4.0, which has a theoretical range of 100 feet/33 meters. However, things like metal, walls, and other items will get in the way. Also, if these are packed inside a metal box, the range will definitely suffer. I tried them inside my house, and I could easily get it work from different rooms, which is really impressive for such tech. They run on batteries, but since they are based on Bluetooth 4.0, and cleverly designed, the battery promises to last over a year. Obviously, I have not had the chance to test that. Even if they run out, the batteries are simple CR2016 watch cells, and are easily available online for not much. They generally come in a 2 coin option, but you can buy more coins, or buy a pack of 4 as well. 2 coins retail for £39.99. These are quite handy little things, specially if you’re in the habit of losing your remote controls, or keys. However, the fact that they don’t work on most Android phones is definitely a turn off. They will definitely make very cool stocking fillers this Xmas though.